Do you like NOFX? They like you. Wanna know how I know? It’s because they keep putting out totally sweet punk rock cds. This new one, Coaster, even has music included. You know this because it says so right on the cover. Pretty sweet, huh? Aside from the sweet retro bar theme The disc also includes 12 tracks of wisdom and boozedom. Tales of middle class America gone by and the joys and laments of being a drug abusing alcoholic. Oh and lesbian Canadians. What more could you really want? 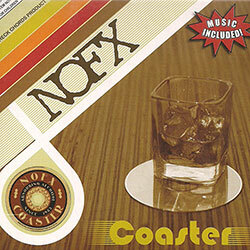 Comedic discourse aside, if you haven’t cared for the last couple of releases (shame on you, but I understand) give ol’ NOFX another try. Coaster might just bring you back into the fold.